A photography workshop can, and should be, a very special learning experience. Under the right circumstances, a good workshop can have a measurable, positive, impact on your shooting. Under the wrong conditions, it can be frustrating and fruitless. Workshops should be small and intimate. It is very difficult, if not impossible, to create a valuable learning environment in groups larger than 7 or 8 students per instructor. To paraphrase a quote from Galen Rowell; “if your group has 20 people in it, it’s a seminar not a workshop.” Some of the best workshop learning opportunities come from interactions between the attendees. In the short time that you have together, you just cannot foster that environment with a large group. The distractions of daily life often make it difficult to let our creativity shine. Often, we try to include photography into our vacation time. Planning the trip requires time and effort. The details of the trip become so tedious that it becomes very difficult to release your creative mind to the task of making images. Those details, or left-brain thinking, cloud our creative nature. The result is, often, a memory card full of uninspired images. A workshop allows you to free your mind of those details. The leader of the group is hired to think about what time we need to leave in the morning, when the light is right in that meadow, where to park to find the trail to that special spot and the time of the year when the rainbow shows up on that rock. All you have to do is show up with open eyes and an open mind. What you get in return are some new friends, some memorable images and hopefully a new personal vision of a very special place. This image was taken in the Alabama Hills at the base of Mt. Whitney, not far from the Mobius Arch. I was there in the Fall of 2008 assisting on a Gary Hart workshop. The group was photographing a very dynamic sunset when I noticed this silhouette of one of the students. Directly to the right of her tripod legs is Mount Whitney. Because the sky was very “hot” I made the choice to expose for the sky only and let everything else fall to a silhouette. I used a 2 stop soft graduated neutral density filter and a circular polarizer to exaggerate the dramatic sky. The image was made using my Canon 5D and my Canon 24-70 f/2.8L lens at 68mm. The exposure was 1/60th of a second at f/11 and ISO 100. 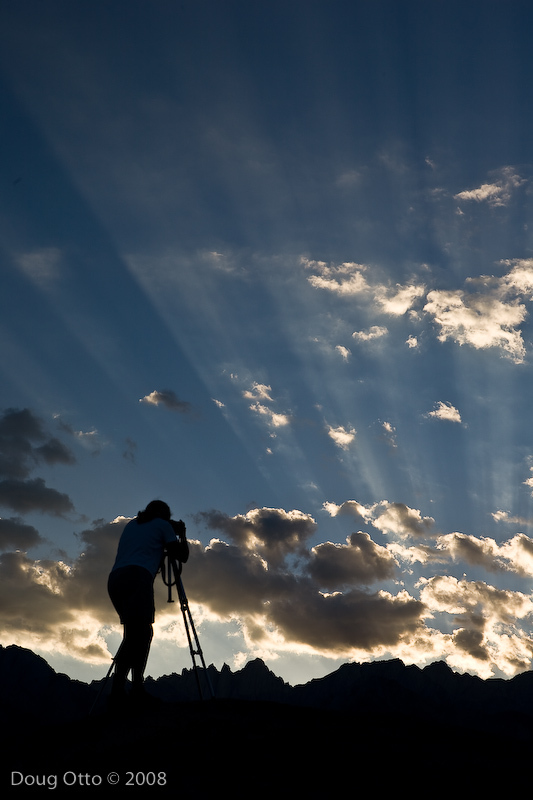 This entry was posted in Photography and tagged clouds, God beams, Mount Whitney, photo workshop, silhouette, sunset. Bookmark the permalink.